It's tough. Some of you ask why as we don't update, we wouldn't at least tease a bit about the future versions. They say it feels like the project is dead. These first two years in the making were going to be tough and apparently slow, but we knew that. We know where to go, what has been done and what's left to do. We have a confident aim, but it's still hard to keep on the focus and discipline. There are others who work in the looper business like us, and are getting their stuff out. We think we're doing things a bit differently and not bragging about anything is probably a good decision. But boy it's frustrating sometimes not letting the things get out because they're simply not sufficiently baked. It's hard not to show you what we've worked on and what's waiting for you up the road (we did a bit of that in the past, but hey, we were young and the stuff was quite obvious ;) ). 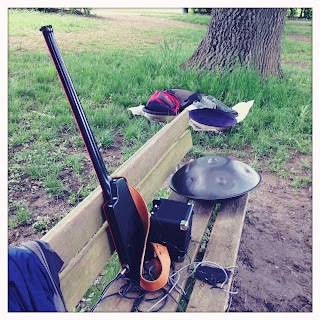 Claudius Maximus and Z doing some Hang-Bass-Loopr in the park on a sunny (but muddy) Thursday afternoon. So much fun we can even tease you about that however. Loopr is fun to use, because live-looping anywhere / anyplace is fun, and maybe you'll get a bit of that happy feel too! We would never. Let's trade it instead for more of the fun we already had! And we'll also try to share it to you in the meantime.